I would like to thank all of the Teams for playing their Quarter Final Matches so quickly. I now can tell you which Teams have got through to the Semi Final Rounds. As before, I will be advising all Team Captains and Club Secretaries of their Teams Handicap Points on either Friday 30th or Saturday 31st March. I must also remind you all again that it is the responsibility of BOTH Team Captains (at the time of the match) to ensure that the Scorecard is readable, completed correctly and is sent in with 72 hours (3 days) of the match being played. Please make sure if you have to postpone a Handicap Match that firstly you make sure you inform myself of this, secondly that match may not be postponed beyond the Friday of the week preceding the next round. 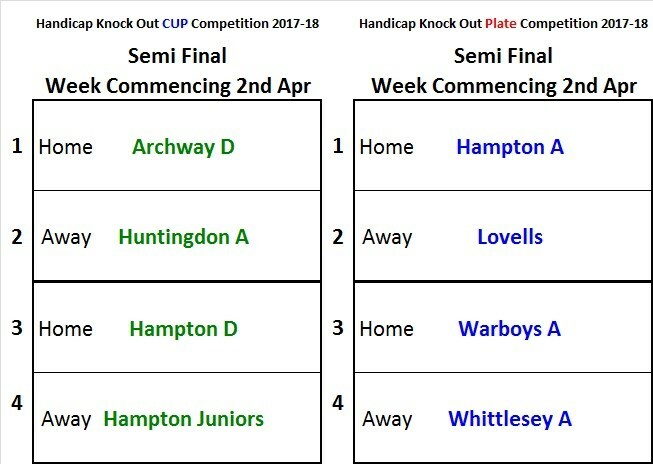 Semi Final Rounds must be played before Friday 27th April 2018. Please email your Completed Handicap Scorecards to this address: - padtta.fixturessecretary@gmail.com.